It doesn’t take very much power to send a reasonable ham signal, and if you’re using Morse Code it takes almost nothing – a real benefit in an emergency. But as the article notes, you don’t have to learn Morse to get your ham license any more. 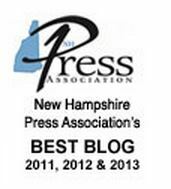 If you want to know more, check out ARRL, the national ham radio association – it has a New Hampshire chapter.